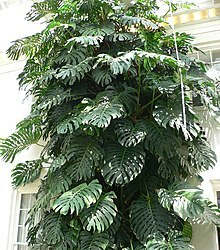 Monstera deliciosa is a species of the genus Monstera, which is commonly found in tropical Central America. The term deliciosa in the species name means delicious, and refers to the edible fruit of the plant. The plant is a vine (a climbing plant). Originally, the plant was found the Mexican states of Oaxaca, Veracruz, and Chiapas. It also grows in Costa Rica, Guatemala, and Panama. It is also commonly grown as a houseplant. Wild plants can now also be found in the Southern United States (mainly Florida), Malaysia, India, Australia and the western part of the Mediterranean basin (Portugal, Morocco, and Madeira). This page was last changed on 4 August 2017, at 07:18.